Scene safe! BSI (body substance isolation)! Hi, I’m Amy, with Whitetail Ski Patrol. Can I help you? What seems to be the problem? Can you point to exactly where it hurts? Do you have any allergies? Are you on any medication? Any past medical history I should know about? What’s the last thing you ate? Can you tell me more about the events leading up to this? I’m actually not with the Whitetail Ski Patrol … yet. That’s why this script is in the process of being seared into my mind—because I am a ski-patrol candidate (candidate is to ski patrol what pledge is to a fraternity), and am spending about four hours every Tuesday and Thursday night learning how to assess and treat patients on a ski slope through Outdoor Emergency Care Classes. When the OEC classes end, ski and toboggan training starts. I mention this in part to explain why my posting schedule has been a bit irregular, but also to provide a window into what actually goes into training to be a ski patroller. OEC, roughly equivalent to EMT-B training, means twice weekly four-hour classes that are more intense than I could have imagined, but also more fascinating. Steve and I have been members of the Mountain Safety Team at Whitetail, in Mercersburg, Penn., for the past two years, so we know the mountain pretty well. Turns out we don’t know the human body and everything that can go wrong with it quite so well … but we’re learning. 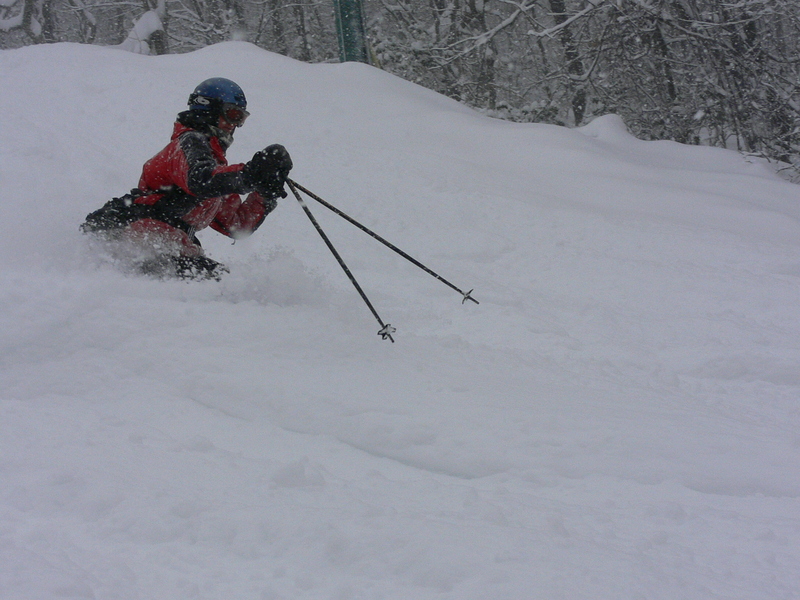 Being part of Whitetail's Mountain Safety Team let us ski through last year's "snowpocalypse." Ask me where the liver is, and the answer’s on the tip of my tongue (Right Upper Quadrant!). I can take a pulse in your foot. I can perform at least a poor approximation of a rapid body survey, or a quick exam conducted on the hill, and am practicing it so much, even Steve, my husband and OEC classmate, has started to refuse care—erm, tell me to quit it and let him watch TV. Stay tuned for more about this latest active outdoor adventure of mine—which will eventually let me help others continue *their* outdoor adventures, too (or at least help them get to safety when their adventures go awry). That’s so amazing that you and your husband are getting OEC training. Goodness knows people get stranded in terrible weather and depend on ski patrol people to help them — or even save their lives! Very cool!! Very nice post. I am taking OEC through the University of Nebraska – Omaha along with my 17 year old son. In fact tonight is our final, having completed the practical exam in the field two weeks ago. As you know, OEC is a very rigorous time consuming and rewarding program. I would really encourage college aged people to invest in an OEC education. I believe is shows a real commitment to their self-education and augments the formal education process as well. Actually for some, this can be a stepping stone towards a rewarding career. Again, good luck. Congrats on passing the practical exam from a fellow student AND a fellow former Big 12 member (I went to CU, and almost traveled to Lincoln from DC for the CU-Nebraska game last week)! We have our practical on Dec. 12, and are in pre-test anxiety-mode. Still, I couldn’t agree more with your sentiments about the class. Good luck on your written exam—we’ve been told that’s the easier part! Please try my OEC super quiz. I going to try to add more throught the season. Very cool! I’m sure that’ll be a great resource for new OEC students!